For undergraduate courses in Introductory Psychology for two and four year institutions. 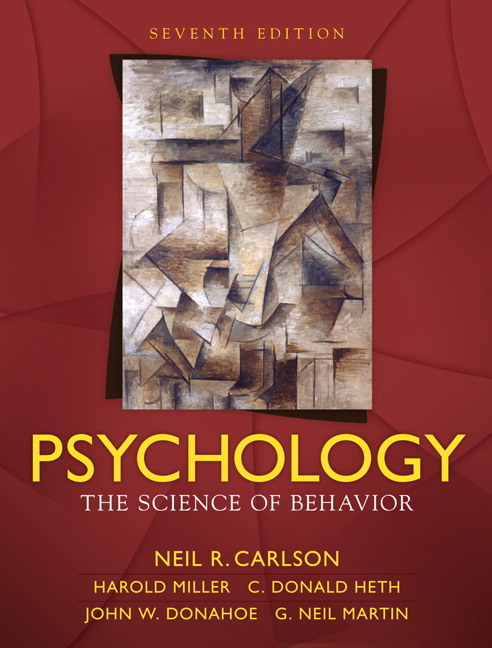 A rigorous biological and evolutionary approach to introductory psychology text written by an international team of authors. Each chapter contains a special issues feature box called Focus On, which highlights a controversial issue, an important cross-cultural research, or an unanswered question in the field of psychology. Encouraging students to hone their critical thinking skills, this feature includes engaging and relevant topics such as the cultural differences in the definition of intelligence, how the brain is like a computer, cultural contexts for remembering, cognitive development and television viewing, the evolution of love, and assessing therapeutic efficacy. Each chapter places emphasis on international perspectives, offering students a unique global view of the field of psychological research. International research is emphasized on topics such as crashing memories, response bias, social attachment, eye movement, and behavioral therapy, among others. The visual program continues to highlight our biological and anatomical emphasis. We have again tapped the talents of Jay Alexander, the medical illustrator responsible for the successful art program in Carlson’s Physiology of Behavior textbook. Jay has reviewed and updated the art program throughout this edition, creating a more vibrant, diverse, and contemporary presentation. Each chapter begins with a chapter outline that gives students a survey of what the chapter discusses. The chapter outline is followed by a Prologue, a lively narrative that illustrates phenomena covered in the chapter. Questions to consider, designed so students can apply what they have learned to everyday issues, follow each major section in the chapter. Key terms and their definitions are listed in the margins on the pages where they are introduced for ease of studying. New case studies provide ample opportunity for students to read about the applicable examples of psychological concepts. A new Epilogue, found at the close of each chapter, sheds light on the opening Prologue and brings the content of the chapter full-circle. 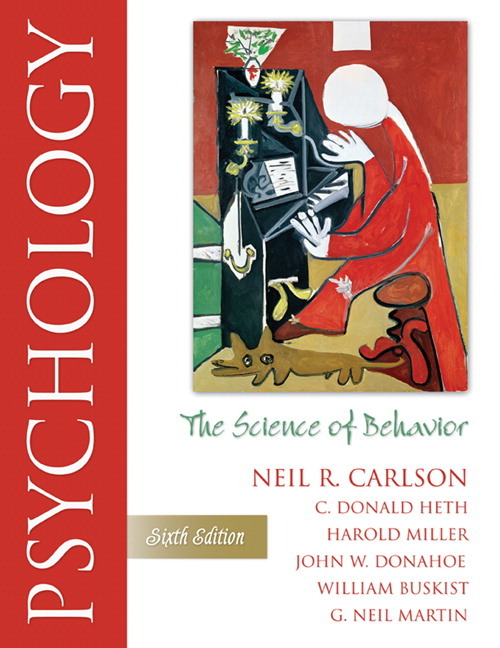 Psychology remains a rapidly evolving field, and the seventh edition reflects these many exciting changes. In addition to consolidation efforts, key section reorganization, and reference updates, the following is a list of some of the major revisions to this edition, organized by chapter. Additional information on the influences of education and therapy on the development of psychology. New section on style=": 11pt; : 'Times New Roman'">Psychology remains a rapidly evolving field, and the seventh edition reflects these many exciting changes. In addition to consolidation efforts, key section reorganization, and reference updates, the following is a list of some of the major revisions to this edition, organized by chapter. New Case study elaborates opening prologue with an individual family’s story. New case study of David Reimer, used to illustrate the complexity of gender identity. New Epilogue contrasts Romanian orphanage story with that of David Reimer. New section on traits across different cultures. FOCUS ON: How Scientific is Psychology, Really? FOCUS ON: What Are the Roots of Psychology Within Chinese Culture? Descriptive Statistics: What Are the Results? FOCUS ON: Insight-Can Basic Learning Procedures Help Understand Complex Behavior? FOCUS ON: Self-Control--How Does Conditioned Reinforcement Affect Self-Control? FOCUS ON: Does the Brain Work Like a Computer? FOCUS ON: How Does Culture Affect Visual Perception? How Long Does Memory Last? Does Conscious Thought Control Behavior? Intelligence: Is It Global or Componential? What Determines the Strength of Behavior? What Determines the Persistence of Behavior? Neil Carlson is Professor Emeritus at the University of Massachusetts, Amherst. His research focused on the role of the limbic system in learning and species-typical behavior. He received his undergraduate degree and Ph.D. from the University of Illinois, Urbana. neuroscience textbooks—Physiology of Behavior (currently in its tenth edition) and Foundations of Physiological Psychology (currently in its seventh edition). His books have been translated into eight languages. Hal Miller has been a professor of psychology at BYU since 1985. He served as Dean of General and Honors Education from 1988 to 1993 and is Karl G. Maeser General Education Professor. Dr. Miller’s research interests include behavioral economics, evolutionary psychology, and educational reform. He has been associate editor of the Journal of the Experimental Analysis of Behavior. Dr.Miller received his Bachelor of Science degree from Arizona State University, where he studied with Peter Killeen, and his Ph.D. from Harvard University, where his dissertation adviser was R. J. Herrnstein. Don Heth received his undergraduate degree at New College in Sarasota, Florida and his Ph.D. degree at Yale University. At the University of Alberta, Dr. Heth teaches introductory psychology courses and a fourth-year seminar to students in the honors program. He is an active researcher in the areas of human wayfinding and navigation, comparative spatial cognition, and models of eating disorders. Recently he has been involved with projects to describe lost person behavior and to develop computerized tools to manage this information in operational settings. John Donahoe is an Emeritus Professor in the Department of Psychology and the Interdisciplinary Program in Behavioral Neuroscience at the University of Massachusetts at Amherst. Dr. Donahoe is an active researcher in the area of learning and cognition and a long-time teacher of the introductory psychology course. He is an author of Learning and Complex Behavior (www.lcb-online.org) and Neural-Network Models of Cognition: Biobehavioral Foundations. Dr. Donahoe received a Ph.D. in experimental psychology with a subspecialty in neurophysiology from the Thomas Hunt Morgan School of Biological Sciences at the University of Kentucky. Dr. G.Neil Martin is Reader in Psychology, a Fellow of the Royal Society of Arts, a Chartered Scientist, and Director of the Human Olfaction Laboratory at Middlesex University, London. Dr.Martin is the author of the first general European textbook on Human Neuropsychology (Pearson Education, 2008), now in its second edition. He also writes the best-selling European adaptation of Psychology with Neil Carlson, now about to go into its fourth edition. His research interests include the human senses of smell and taste, the psychology of humor, perceptions and misunderstanding of psychology, and the interactions between personality and learning style.